Orthodontics isn’t just about a better smile. A precise alignment of teeth can make it easier for you to bite, chew and speak. It helps prevent dental issues later in life that stem from crowding pressure, tooth decay, abnormal wear of enamel and surfaces, and jaw joint pain. Traditional braces, which prevents and correct improperly positioned teeth and jaws are more effective than other options like clear braces or Invisalign aligners and are less expensive. 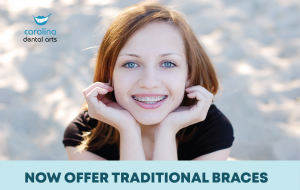 We’re now offer traditional braces for adults and kids! Plus, call one of our locations to receive a FREE consultation and $500 OFF braces! Carolina Dental Arts is proud to serve patients at our locations throughout North Carolina, including Falls Of Neuse, Glenwood South, Goldsboro and New Bern Ave.